Think about the grand cathedrals and churches in Europe. Most of them have impressive structures and are rich with history. You can discover that same grandeur at St. John’s Cathedral in Denver. The Episcopal church in Colorado was established in 1911 and is on both the National Historic Register and is designated as a Denver Historic Landmark. This distinctive church now has new DaVinci Single-Width Slate roofs overhead. Yes, roofs. There are three distinctive buildings, so it was determined to use European – VariBlend on Roberts Hall to replace damaged slate and Canyon – VariBlend on the Parish Hall to replace older clay tiles. A Slate Gray – VariBlend was used on the main cathedral. The results are magnificent. 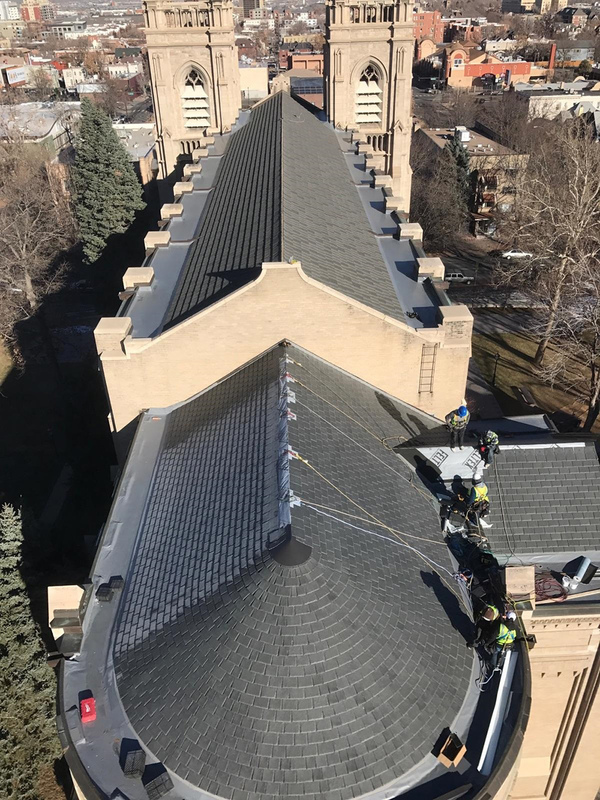 The four-month installation process was completed by Horn Brothers Roofing in Denver, a company that has completed more than 80 DaVinci composite roofing projects in the past, including other churches. Now finished, the roofing on the historic church compound has an old world look with all the advances that science and technology have to offer. According to church members, the roof complements their building structures while providing protection from severe weather. To learn more about how DaVinci composite slate roof and shake roofing products are used on churches, see Praying for a New DaVinci Roof and Custom Roof Color Answers Church’s Prayers.